This gallery is filled with enchantment, imagination, and intrigue. 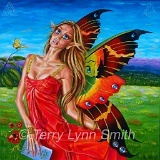 Each faery has heir own distinct characteristics: personality, attitude, demeaner, and expression. Some of the faeries are accompanied with creatures from far away places yet to be discovered. These paintings will invoke mystery and imagination to the viewer.